"No one is safe from the slime!" screamed Smith. "You have to earn the slime! It's an honor." Slime was an instrumental part of this year's show. At the 25th annual Kids' Choice Awards, the slime runneth over. 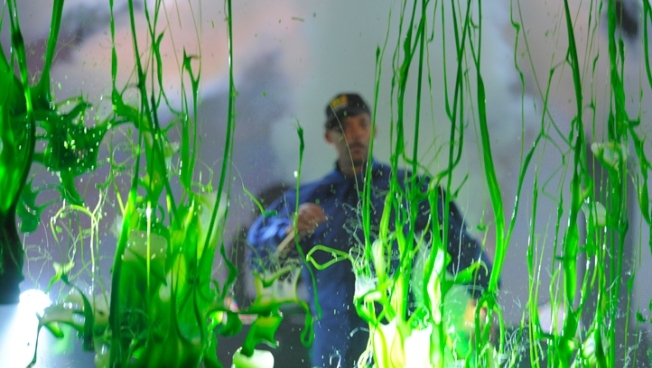 Host Will Smith opened the 25th annual Kids' Choice Awards promising a record amount of the show's trademark green gunk. Though some 20 awards are presented at the KCAs, the real suspense isn't who will take home a "Blimp" (the show's Oscar), it's when and on whom the slime will spill. It's like a baptism into kid-dome that can come at any moment: from a hidden bucket, dumped from the rafters or exploded from little orange blimps. Halle Berry was the first to be covered, but she was far from alone. She was joined by "Twilight" star Taylor Lautner (who won favorite "buttkicker"), "Glee" star Chris Colfer and male singer winner Justin Bieber, who was utterly drenched along with Smith at the end of the show. The KCAs are Nickelodeon's annual celebration for kids, and it's often the most-watched children's program of the year. They draw a considerable roster of stars looking to thank their smallest fans and cater to their youngest demographics. "This is, like, the coolest award show ever," said "Twilight" star Kristen Stewart, accepting the award for favorite movie actress. Smith, himself a 10-time Blimp winner, started the show with an elaborate, digitally-animated skydive from Nickelodeon's trademark blimp. Smith was then hoisted from the rafters to the stage of the Galen Center at the University of Southern California in Los Angeles, where thousands of glow-stick waving fans cheered him — including first lady Michelle Obama. Obama later presented "the big help" award for charity work to Taylor Swift. Upon receiving the award, the pop star said, "I am freaking out." Nickelodeon introduces many kid-friendly quirks to the usual award show festivities. It rolls out an orange carpet, rather than a red one, and envelopes are the last way winners are announced. Saturday night's choices came by way of a sword eater, a statue impersonator and giant heads held aloft from the crowd. Winners are chosen from voting online. Selena Gomez won for both favorite TV actress and female singer. Adam Sandler took home the award for favorite movie actor. And Katy Perry, shortly after performing, was given the award for favorite voice in an animated movie for "Smurfs." "The only reason why I'm still here today — and remember this — is because I've never grown up!" Perry told the young audience. More than 7.3 million watched last year's awards. This year, Nickelodeon badly needs the KCAs to continue such a success. In March, for the first time, the Disney Channel beat out Nickelodeon in average total daily viewers — a title Nickelodeon had held every month since 1995. Nickelodeon's own series "Victorious" won best TV show. Jake Short, star of the Disney Channel's "A.N.T. Farm," won best TV actor. But the most ceremonious moment of the KCAs is the slimey finale. The honor — which Smith said had been chosen by online votes — went to Bieber, who made a surprise appearance late in the show. Smith clutched Bieber as fountains of slime poured out across the stage, while Obama — splattered by a few drops — danced in the seats.